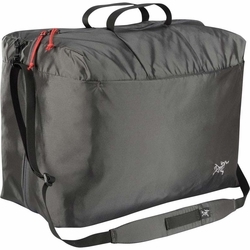 ARC'TERYX Index 10+10 Travel Bag. Designed for organization in a larger duffle, it also works as convenient carry on or as a shoulder bag for day trips. Compact 10 liter capacity has zippered mesh dividers, and an exterior zippered pocket to securely carry travel documents or a tablet computer. A removable adjustable shoulder strap is included, and there is a dual top handle for hand carrying.